St. John’s place is a short, one block long street located in Allentown. The street is named after the St. John family. 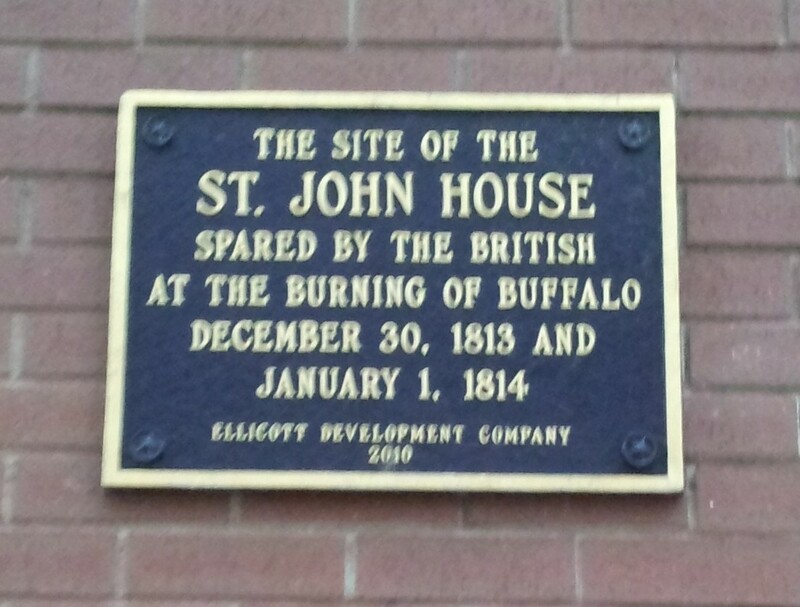 The St. John family had a significant role during the Burning of Buffalo 200 years ago, on December 30, 1813. 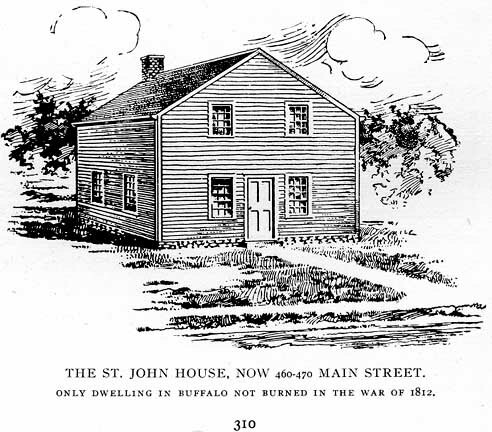 The St. John House was the only house to survive the burning of Buffalo. Only three buildings remained after the burning: The St. John House, the jail on Washington Street near Eagle Street and David Reece’s blacksmith shop on Seneca Street. Gamaliel St. John was born in Norwalk Connecticut on September 22, 1766. Margaret Marsh was born in Kent, Connecticut. Margaret’s father was among the first class of graduates at Yale College. Gamaliel and Margaret were married in Kent on October 16, 1788. They moved to Danbury, Connecticut where they lived for several years, before moving to Oneida County, New York. While there, Gamaliel worked on constructing a portion of the turnpike from Albany to Cayuga Lake. They had many children: Elijah, Northrop, Maria, Aurelia, Cyrus, Sarah, Margaret, Parnell, Martha, John and LeGrand, and Orson. In 1807, they moved to a farm in Williamsville. Their farm was located near where the historic mill is now located in Williamsville. They lived on the farm for three years before moving into Buffalo in the spring of 1810. The family settled on Main Street. Mr. St. John kept a tavern on the corner of Main and Court Streets. Cyrus St. John died in December 1812 of camp distemper (also known as diphtheria). 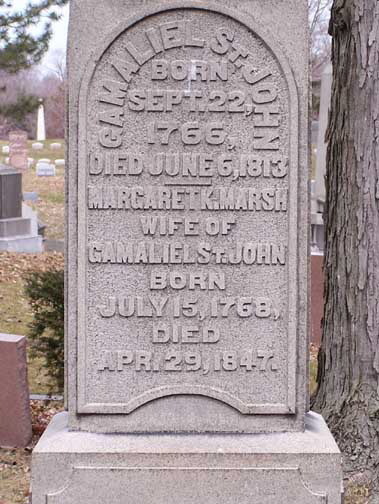 Gamaleil and his eldest son, Elijah died on June 6, 1813, drowning in the Niagara River when their boat capsized after coming into contact with the war vessel John Adams, which was anchored in the River. Gamaleil and Elijah were bearing dispatches from army headquarters in Buffalo to a division in Canada. Just before the burning of Buffalo, there were approximately 2,000-4,000 drafted and volunteer militia encamped in front of the old courthouse. Recollections of the St. John children indicated that the citizens of Buffalo felt safe due to the presence of the militia, who could be seen marching through the Village. When the alarm rang for people to evacuate Buffalo on December 30, 1813, the St. John family planned to leave in two trips. Mr. Asaph Bemis, the husband of Aurelia St. John, accompanied the family. Conditions along the roads prevented Mr. Bemis from returning. 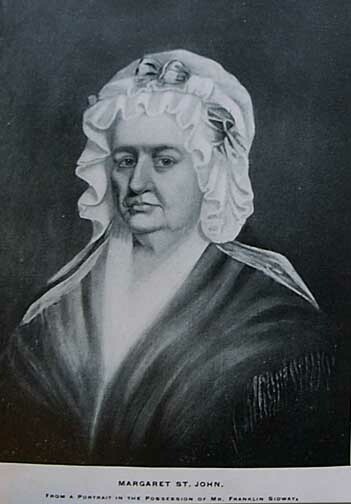 Margaret St. John was left in the house with her daughters Maria and Sarah. The St. John house was located at 437 Main Street, near Mohawk. The house was demolished in 1871. Today, the location is marked by a plaque. As Buffalo settlers returned to town on New Year’s Day, Mrs. St. John and her daughters took in the refugees, while warding off constant threats to their home. Many of the settlers returned to town and constructed makeshift roofs over their former basements, living in them for the rest of winter until a new house could be constructed. Following the fire, a relief committee provided money, supplies and clothing. The committee raised $13,000 quickly to help the citizens of Buffalo. The State Legislature also contributed nearly $60,000. Reconstruction of Buffalo happened quickly. By April, Joseph Pomeroy had rebuilt his hotel. After only five months, many stores and taverns were erected. While the St. John family had its share of hardships, the family prevailed. The women sold their needlework and managed to survive on that income, keeping their place in society of the time. Margaret St. John died April 29, 1847. She and her husband are buried in Forest Lawn. Sarah St. John was only 16 at the time of the fire, spending her days putting out fires set by the Native Americans and foraging for food under the cover of night. At one point, the Native Americans entered the St. John home. Sarah fled in terror, chased by a man. It is said that he raised his tomahawk to kill her, but she laughed at him. He was so taken aback that he could not kill her. He instead painted her face and let her return to her home. Sarah went on to become the second wife of Samuel Wilkeson. She was among the first to dig the earth for what became the Erie Canal on August 9, 1823. She was beloved by the people of Buffalo; they reopened the Franklin Street Cemetery to bury her when she died in 1836, despite the cemetery being closed due to cholera fears. (The Franklin Street Cemetery was located where the present County Hall is now). Sarah’s grandson by marriage, Tellico Johnson, was one of the earliest developers of the Historic Plymouth neighbrohood. He developed Orton and St. Johns Places and lived at 22 Orton Street. The streets were created in 1884, from what was the Buffalo Circus Ground. Several big name circuses performed there, including WW Cole Hippodrome, PT Barnum Circus, John B. Doris Inter-Ocena Show and the Adam Forepaugh Show. In 1882, PT Barnum brought the elephant legend, Jumbo, to the grounds from London. So remember the St. John family, all of the settlers of Buffalo, and all who fought in the War of 1812 today. Remember that we’ve since had 200 years of peace between the United States and Canada. The Peace Bridge plaza today stands where Fort Porter was located, a fitting tribute to the years of peace replacing a military establishment. Remember the spirit of the earliest settlers of Buffalo, who were not afraid to brave a winter in makeshift home in order to build what became our city. I believe that pioneer spirit still lives in Buffalo today….and that we can rebuild after 50 years of decline. Be sure to check out the street index to learn about other streets. Mrs. Jonathan Sidway. “Recollections of the Burning of Buffalo and Events in the History of the Family of Gamaliel and Margaret St. John”. Publications of the Buffalo Historical Society, Volume 9. Buffalo NY. 1906. Brown, Christopher. “Historic Plymouth Avenue in the Kleinhans Neighborhood”. Kleinhans Community Association. May 2008. Severance, Frank, editor. The Picture Book of Earlier Buffalo. Buffalo Historical Society Publications, Vol. 16, 1912. This is Part Two of a series on Joseph Ellicott, for whom Ellicott Street is named. If you haven’t read Part 1 yet, you can read it by clicking here. Following his time surveying in Washington, DC and along the Georgia-Carolina boundary, Joseph Ellicott began to survey some property in Western PA that a group of Dutch investors purchased. The Dutch Investors had formed the Holland Land Company to invest in land in New York and Pennsylvania. The Company also purchased a large tract of land in Western New York known as the Holland Purchase. The Holland Land Purchase consisted of approximately 3,250,000 acres of land, stretching from 12 miles west of the Genesee River to the present western boundary of New York State. Much of the land had been owned by Robert Morris, who had purchased it from the Senecas. Between 1798 and 1800, the area was surveyed under the direction of Joseph Ellicott. Joseph brought a crew of 11 surveyors, each with his own assistants to survey the property. Joseph himself surveyed the east line of the purchase. While Joseph laid out the site of Buffalo, there were many who doubted a city would establish there. Interference from the State and Buffalo Creek Reservations was calmed due to Joseph’s skills as a surveyor and diplomat. He persuaded the Senecas to leave the Village’s location out of the reservation. At the time, the Buffalo River as we know it was only a simple stream that ended in a marshland. Joseph foresaw that Buffalo would be important as a port due to the convergence of Buffalo Creek on Lake Erie. In Spring 1798, Joseph opened the first wagon track in Erie County, improving the trails from East Transit to Buffalo, and from Buffalo to Batavia. The Holland Land Company had purchased the land, intending to sell large tracts of lands to investors for a profit. The bankers were unable to sell large tracts of land and began to sell directly to settlers looking to build homes. Holland Land Company bought the land for 35 cents per acre and sold it for $2-2.50 per acre. 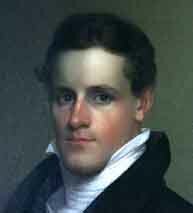 Joseph Ellicott was appointed Resident Agent of the Holland Land Company and opened an office in Batavia in 1801. He oversaw the surveying crews to complete the subdividing the land into townships , each six square miles. The townships were then subdivided into lots. The officers of the Holland Land Company had an extensive program to build roads, lay out towns and attract settlers to the area by selling small tracts of land on liberal terms and providing loans to help businessmen set up shops. The typical agreement was a down payment of 5-25 percent to be paid in 4-8 years at 7 percent interest. During that period, the settlers were required to clear several acres of land, erect a dwelling and fence in a portion of his property. Pioneers purchasing land here faced the hard task of relocating. It took weeks or months to navigate over muddy, rugged roads. The area was primarily a primeval forest. A typical settler would have to clear about 50 trees to build a modest log cabin. The first map of Buffalo was made by Joseph in 1804, calling it the Village of New Amsterdam, to honor the Holland Land Company. The fledgling Village had a population of about 25 at the time, including a blacksmith, a silversmith, and half a dozen houses. While Ellicott wanted to call it “New Amsterdam”, the residents preferred the name of Buffalo Creek, so their name stuck, which was then later shortened to Buffalo. 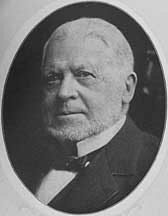 He is responsible for the radial street plan of the City of Buffalo. He named most of the streets after members of the Holland Land Company. 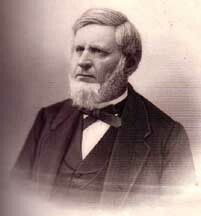 Joseph Ellicott also purchased his own share of Downtown Buffalo, a 100-acre tract of land known as Outer Lot 104, bounded by the current Main Street, Swan Street, Eagle Street and Jefferson Avenue. There was a half-moon shaped piece of land along the Main Street frontage of Joseph’s property, from which Niagara, Church and Erie Streets radiated. Joseph planned to build a mansion on this half-moon; however, in 1809, the Village authorities decided to straighten Main Street. 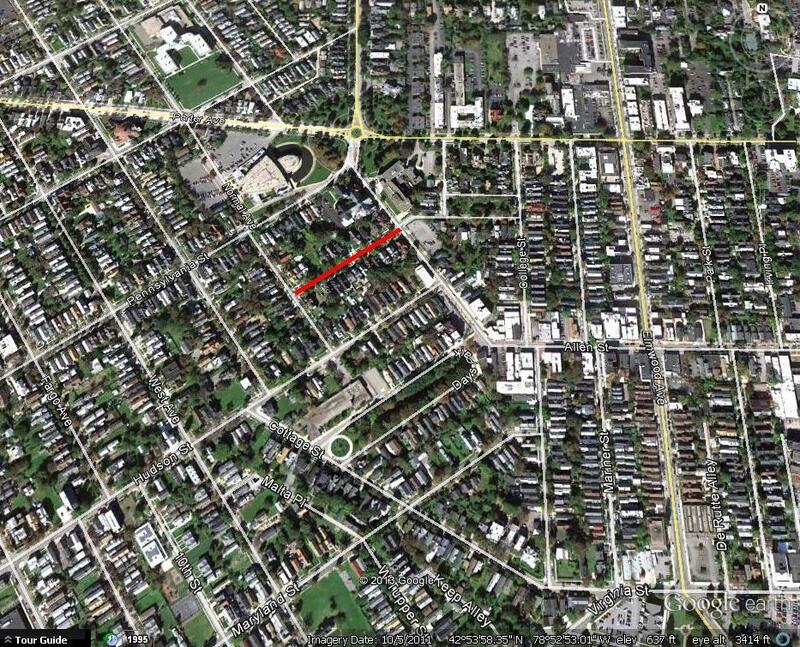 Ellicott abandoned the idea of building on the lot and during his lifetime, no development occurred on Outer Lot 104. Also, Ellicott changed his will, which had been drawn to leave the tract of land to the City for a public park. Today, the Ellicott Square Building sits on the Main Street part of the lot, a fitting reminder of Ellicott’s influence in Buffalo. Many of the settlers were unable to pay back for their land; however, Joseph was lenient with them and allowed them to extend their payments. After 10 years, the Holland Land Company opened an office in Mayville in Chautauqua County. This allowed them to better serve the pioneers by ridding them of the burden of travelling all the way to Batavia to make payments. During the War of 1812, the Holland Land Company allowed settlers to make payments in goods instead of cash. They mostly accepted black salt, which they would then make into pearl ash to sell to Montreal. In 1833, New York State laws changed, forcing foreign owners to be taxed the same as residents. The Holland Land Company began to enforce their payment schedules and were no longer as lenient with settlers. In 1835, the Holland Land Company sold its remaining holdings in Chautauqua County to Trumbell Cary, George Lay, Jacob LeRoy and Herman Redfield. They instituted a new policy called the “Genesee Tariff”, forcing those who still owed to pay a penalty of a specific amount per acre in additional to the original price paid for the land. They also threatened to sell the land to another purchaser if payments were not made. The settlers fought back against the Genesee Tariff. In 1836, 500 men gathered in Hartfield, rioted and marched to Mayville to destroy the Land Office. The building and furniture were destroyed and the company’s books were burned in a bonfire. The company salvaged what they could and reopened an office in Westfield. William Seward was made the Land Agent of the new office, and was able to renew peace. Seward later went on to become Abraham Lincoln’s Secretary of State, and is best known for “Seward’s Folly”, aka the purchase of Alaska. A stone vault near the present day County Courthouse is the only visible landmark of the Holland Land Company’s presence in Chautauqua County. In 1839, the Holland Land Office in Batavia closed. The last holdings of the company were sold in 1846 at little profit. The building, which was built in 1815 to replace the original log cabins is still standing in Batavia. The building is listed on the National Register of Historic Places. The building was saved by a Batavia High School teacher, John Kennedy, and the Class of 1894. The site currently operates as the Holland Land Office Museum. For more on Ellicott’s legacy in Western New York, check out Part Three by clicking here. Beers, F.W. “Our County and It’s People: A Descriptive Work on Genesee County, New York.” J.W. Vose & Co Publishers, Syracuse NY 1890. “Our Street Names: They Tell Much of Buffalo’s History”. Buffalo Express, November 14, 1897. Burns, Rosamond. “Paving the Way For Settlers: The Rise and Fall of the Holland Land Co.” Buffalo News, January 25, 2004. Houghton, Frederick. “History of the Buffalo Creek Reservation”. Buffalo Historical Society Publications, Volume 24: Buffalo, 1920.